NGC 660 is an uncommon type of galaxy called a Polar Ring Galaxy. In a polar ring galaxy, there are one or more rings of stars, gas, and dust that orbit the galaxy nearly perpendicular to the main disk. Astronomers hypothesize that this type of galaxy is formed from a near collision of two galaxies. 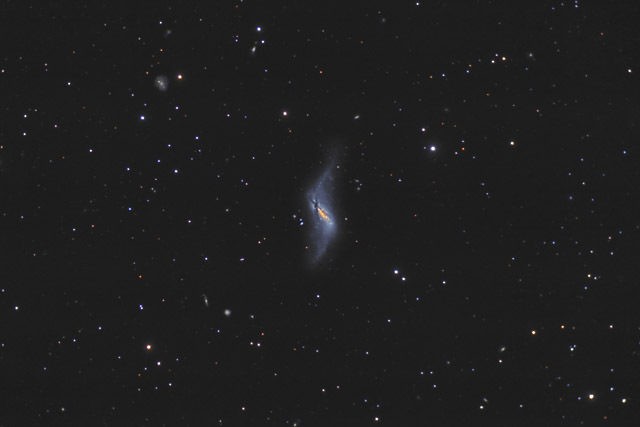 While the galaxies are interacting the polar ring galaxy strips some gas and dust from the other galaxy and this newly acquired matter begins orbiting in the perpendicular plane. Be sure to click on the image to see the high resolution version, as there are numerours background galaxies scattered throughout the photo. In this image, North is up, This image is cropped to 76% of the original full frame. Notes This galaxy is a fascinating target. I enjoyed excellent seeing on all of the nights I photographed this object. However, I had several nights where I had some high clouds. As such, the large amount of exposure time I had on this object didn't pay off as well as it could have. Nonetheless, I captured a decent amount of the faint halo, and the image enjoys fairly good detail.